Spring in Raleigh is almost a month ahead of usual (is usual a thing anymore?). This means we’ve had red maples flowering since mid-January. More importantly they have been visited by bees the whole time. Not just honeybees either. We have been trapping bees in red maples for the past month or so and found honeybees, bumblebees, and smaller Andrena spp. 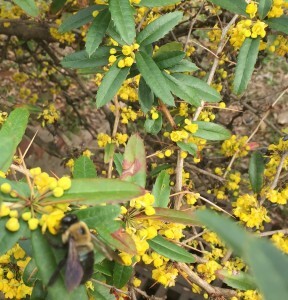 Today I noticed hollies flowering along with redbuds, barberry, and azaleas. 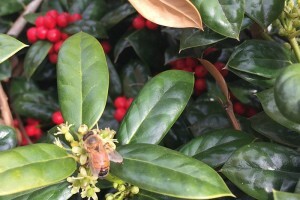 Surely boxwoods, nandinas, cherry laurels, and other species attractive to bees are not far behind (or is it ahead?). This time of year folks making preventive insecticide applications may not usually think about bees and whether plants are flowering. 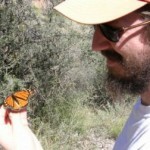 Many insecticide labels restrict applications when bees or flowers are present. Neonicotinoids, like imidacloprid, have been in the news but label restrictions to protect bees are common on most insecticides including other landscape and nursery favorites like bifenthrin and orthene. To be safe: read the labels, don’t make applications when bees or flowers are present, and delay systemic insecticide applications until after flowering. A recent HRI publication and new bulletin and article from Michigan State University could help.